One of the great pleasures of visiting North France in winter is its Christmas markets. They are always full of locals as well as Brits who take ferries from the U.K. to France to buy Christmas gifts (and food and wine of course) for the holidays. Boulevards and snowy squares are lined with colorful wooden stalls selling festive food, handmade goods, and vintage trinkets that are sure to be a hit under the Christmas tree. Amiens, the capital of Picardy, has France’s largest Gothic cathedral (built 1220 to 1288). It’s beautifully lit up throughout December with a nightly son-et-lumiere, making a wonderful background to the annual market in the heart of the city. The market itself is one of the largest in northern France with over 130 stalls plus children’s events in Santa’s Grotto. This is the place for unusual items like Le Creuset kitchenware, regionally made glass, and fish stalls groaning with the harvest of the sea. Local ​specialties include Beauvais chocolate and macaroons made in Amiens. It takes place in the center of the city in Place Gambetta and rue de noyon and la rue des 3 cailloux. Amiens Christmas Market runs from November 23 to December 31, 2018. Arras is the capital of the Artois region in Pas-de-Calais. It's a charming town with a very grand Grand Place, perfect for the Christmas market that takes over the town. Around 140 artists and exhibitors set out their wares around the beautiful arcaded Place selling local crafts, gifts, decorations, and food. Try local delicacies like chocolate rats and the pretty heart-shaped Coeurs d’Arras, either savory (as in cheese) or sweet (ginger). There are various craft demonstrations, so you can try making jewelery or wood carvings at home, a large carousel full of leaping horses, and an ice skating rink. Street performers will entertain you as you sip on that ever popular mulled wine. It’s international, so expect wooden toys from Poland and dolls from Indonesia. Arras Christmas Market runs from November 30 to December 30, 2018. Most people drive past Béthune (south of Lille) on their way to somewhere else. That's a shame as it’s an interesting town with a cobbled town square full of architectural gems. Rebuilt after World War I, you get a panorama of Flemish gables and Art Deco. The area around Béthune and the town itself was made a UNESCO World Heritage Site in 2012. The slightly wacky feel Béthune has is great at Christmastime when a lively market fills the square and the town. There’s a living creche, complete with donkeys, and you can take the family in a ride in a carriage. All kinds of street theater awaits: magicians, make-up sessions, dancing, ice sculptures, carousels, carriage rides, and enough people dressed up in period costumes to make you feel like you’re in a Christmas panto yourself. There's a special St Nicholas Parade on December 6 at 5 p.m. On December 24, Father Christmas climbs down the belfry and hands out sweets to the children in the main square from 5:30 p.m. to 6:30 p.m.
Béthune Christmas Market runs from November 25 to December 31, 2018. If you haven’t visited the old town of Boulogne-sur-Mer behind its walls at the top of the town, then there is no better time for an introduction than at their annual weekend Christmas market. It’s a magical setting and is pedestrianised specially for the occasion. Stalls offer all the usual festive treats, plus local delicacies such as smoked herring and Craquelin pastries. Over the past few years, there have also been ice sculptors, musical parades, and firework displays. St. Nicolas appears in a Father Christmas parade on November 8, 2018 at 4:45 p.m. on Rue Grande. It ends with a fireworks show at 6:30 p.m. near the port. A live band and local folklore all combine to make this something worth seeing. Boulogne Christmas Market runs on December weekends from 2-8 p.m. on Fridays, 10 a.m. to 8 p.m. on Saturdays, and 10 a.m. to 7 p.m. on Sundays. Calais really pulls out the stops with its Christmas Market and a series of related events like a Christmas parade, a magic forest by Town Hall, an indoor ice-skating rink, a 1900s double-decker carousel, carol concerts, and Santa's grotto. Around 80 stalls offer local specialties for sale, such as Saint Nicholas gingerbread cookies. The parade will feature festive floats, dancers, acrobats, elves, animated toys, and more. Calais Christmas Market runs from December 7-23, 2018. It is available from Monday to Thursday from 4-7 p.m.; Friday from 4-9 p.m.; Saturday from 10 a.m. to 9 p.m.; and Sunday from 10 a.m. to 8 p.m.
Dunkerque (Dunkirk) gets a bit neglected particularly as some of the main ferry companies from the U.K. don’t use the port. But it’s a small, pretty town, with a lovely beach stretch backed by hotels, restaurants, and bars. The Christmas market takes place in three main squares across town: Place de la République, Place Jean Bart, and Place Charles Valentin. Look out for the 50 chalets with handmade gifts, a ​ferris wheel, a magic Christmas forest (with elves! ), a free ice-skating rink, Santa's castle at Town Hall, and more than 60 activities planned throughout the month. Dunkirk Christmas Market runs from December 8, 2018, to January 6, 2019. Lens is a former mining town just north of Arras and south of Lille. It’s a small town transformed by the opening of the fabulous Louvre Lens museum, the major outpost of the Louvre in Paris. At Christmastime, Lens celebrates with what they call Once upon a time there was Christmas. There’s a small Christmas market devoted to artisanal crafts and local regional and specialty food. They also put on various activities and events like choral music in the church and son et lumiere on the facade, carriage rides, a Christmas tree, a giant Father Christmas, and Christmas carols. It all happens in and around the Place Jean Jaures. 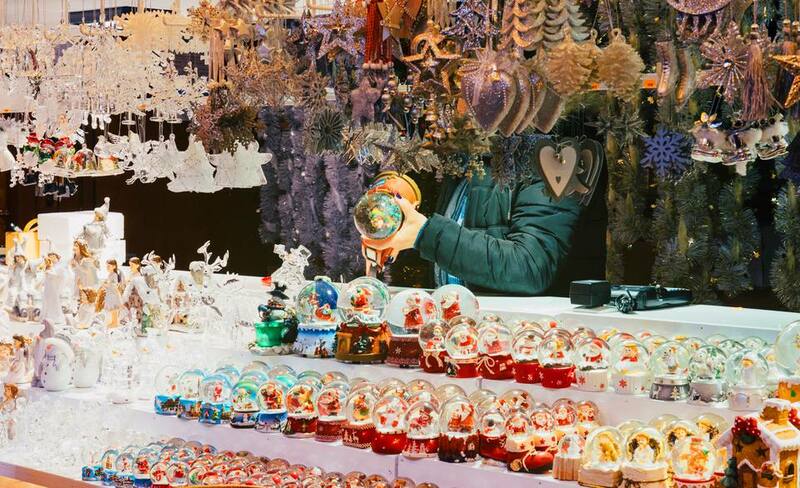 Lens Christmas Market runs from December 8-23, 2018. Licques, just a few miles south of Calais and near St Omer, has a small three-day Christmas market but a remarkable parade that attracts onlookers from far and wide. The Turkey Parade (or Fête de la Dinde) has been a tradition since the 17th century. On Sunday morning, hundreds of turkeys are driven through the town, followed by all kinds of local dignitaries and organizations, particularly the splendid Fellows of the Order of the Licques Turkey, in the procession. You’re offered a glass of local liqueur, Licquoise, then you can choose your turkey. That bit’s really for the locals, but it’s fun and you see a real tradition. It’s all part of the market that is known for its exceptionally good poultry and produce. There's also a dinner-dance to close out the weekend festivities. Licques Turkey Parade takes place December 14-16, 2018. Lille becomes a glorious playground at Christmas with garlands of sparkling lights draped over buildings and ​crisscrossing the streets. Around 80 chalets are full of decorations, gingerbread men, local specialties, and crafts from as far away as Russia, Canada, and Poland. The celebrations are packed into the Place Rihour and the Grand Place, where a big wheel takes you 50 meters in the sky above the massive Christmas tree. Lille is well known both for its excellent restaurants. While you're here, check out its many attractions, such as the magnificent 13th-century Hospice. Lille Christmas Market runs from November 22 to December 30, 2018. Le Touquet Paris-Plage is a stylish and fashionable seaside resort, so it goes without saying that they organize a beautiful Christmas market. The town and surrounding forest areas twinkle with fairy lights and illuminations, and the events follow thick and fast. Le Touquet Christmas Market runs on December 8-9, 2018.